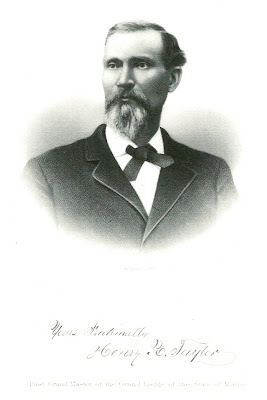 Engraving of Henry Robert Taylor, Grand Master of the Grand Lodge of Maine in 1891 and 1892, from A Portrait Gallery, with Biographical Sketches of Prominent Freemasons Throughout the United States. Images of the two pages of the article are below, after the genealogy section. 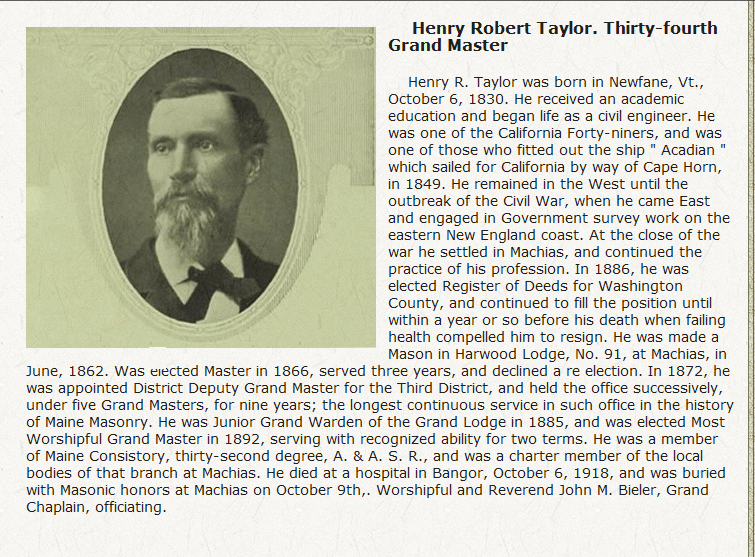 Henry Robert Taylor was born 31 May 1830 at Newfane, Vermont, the son of Denzil and Ann Dorothy (Morse) Taylor, both born and raised in Newfane, Vermont. 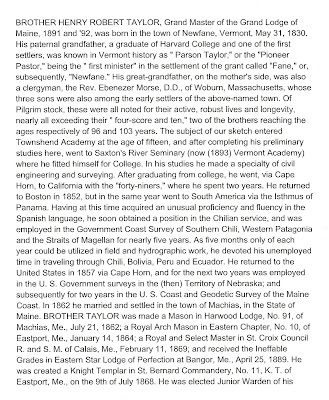 His paternal grandparents were Hezekiah and Sarah (Frost) Taylor. His maternal grandparents were Ebenezer and Henrietta (Sieverley) Morse. Amelia died between 1872 and 1874. I don't have information on the parents of either wife, or if Longfellow and Smith were actually their maiden names. Henry held many important positions in Machias, Maine, as the biography in the images below will show. Click on the images to enlarge them. 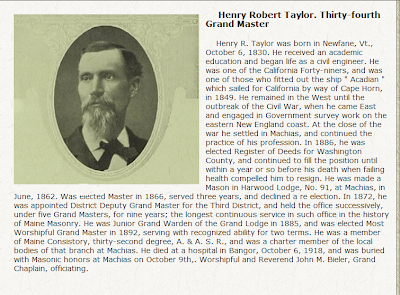 I found another article about Henry Robert Taylor's freemasonry, with another photo. 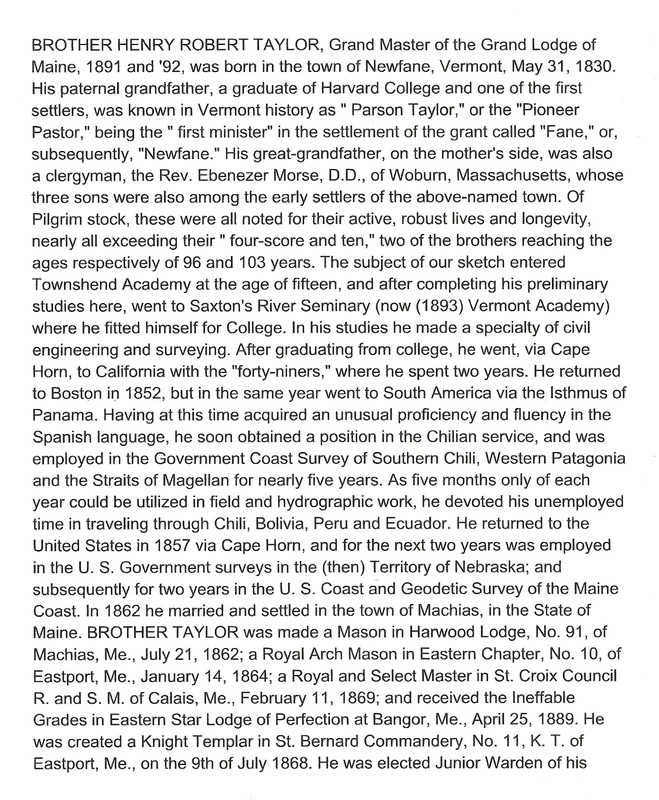 See also the page for Henry Robert Taylor at the Maine and Maritime Canada Genealogy network.